This week’s challenge at Fab’n Funky is being hosted by our lovely team mate, Pat, and she has chosen Tic Tac Toe as her theme. I have had several attempts to do the grid for this – but with no success – so please take a look at the Fab’n Funky blog to see what is on the grid. Then you can use any line – down, across or diagonal – and please tell us which line you used. 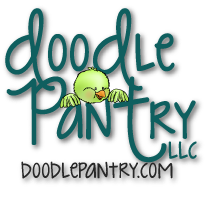 Our fabulous sponsor for this challenge, with a fab prize for the winner, is Doodle Pantry. This is my card using Seahorse Habitat from Doodle Pantry, available here. My chosen line is pearls, digi image, charm. I coloured the image with Promarkers and Copics and added a large pearl to the shell. The paper is from Nitwits and the die cuts are from a Trailing Laurel die from Tonic Studios. The anchor charm and all the pearls are from my stash. So gorgeous Alison, love the little seahorse he is so cute and coloured so beautifully. A really lovely make. This looks lovely Alison, and those dies are just perfect for the seaweed too. Oh wow this is awesome!! Those dies look absolutely brilliant! They match the image so perfectly and you’ve arranged them so well!! Really fab card! This is so pretty. Love it. It looks so dreamy.